It doesn’t happen often, but sometimes I get this burning desire to bake a cake. And that is what happened today. I enjoy eating cake as much as the next person, probably more. Even though I am completely adequate at making them myself, my experimentations don’t always work out. I don’t think they even equate to failure, more often I would describe it as a lack of success. Delicious as it was, my latest cake lacked the finesse and technical completion that I was ideally after. Oftentimes my cake’s shortcomings occur because of my lack of discipline with my measuring cups, but this time it was a prime example of my ideas not being totally thought through from the get-go. I was trying to get creative with the simple concept of a Victoria sponge cake. Fluffy clouds of sunshine yellow batter cut in half by a thick layer of sweet cream and crimson strawberry jam, elegantly topped off with a dusting of icing sugar. What could be better?! I thought my idea was going to be better; I wanted to replace the layer of cream with a layer of meringue. 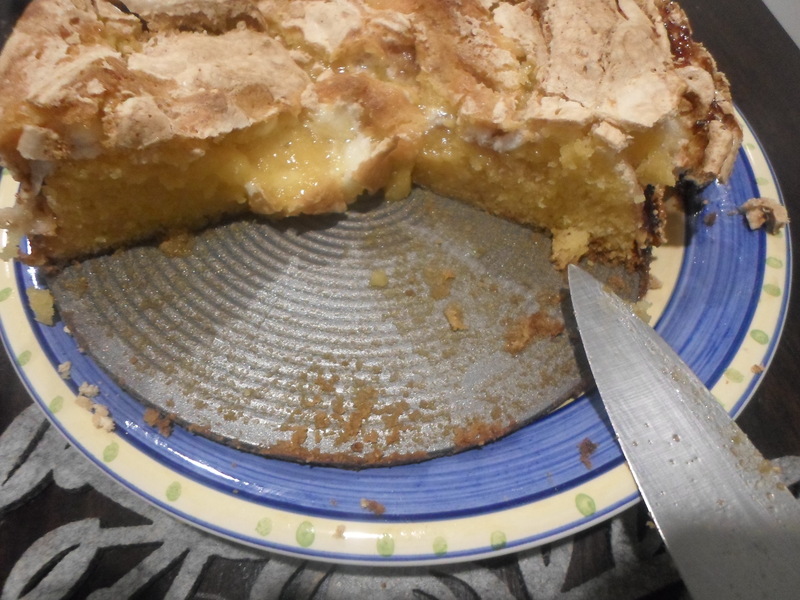 I hate cutting a cake in half to add the centre; I brilliantly decided to bake the meringue in between two layers of cake batter and safe myself some time. The whole event was a bit of a trial – to begin with I couldn’t find my electric beater. 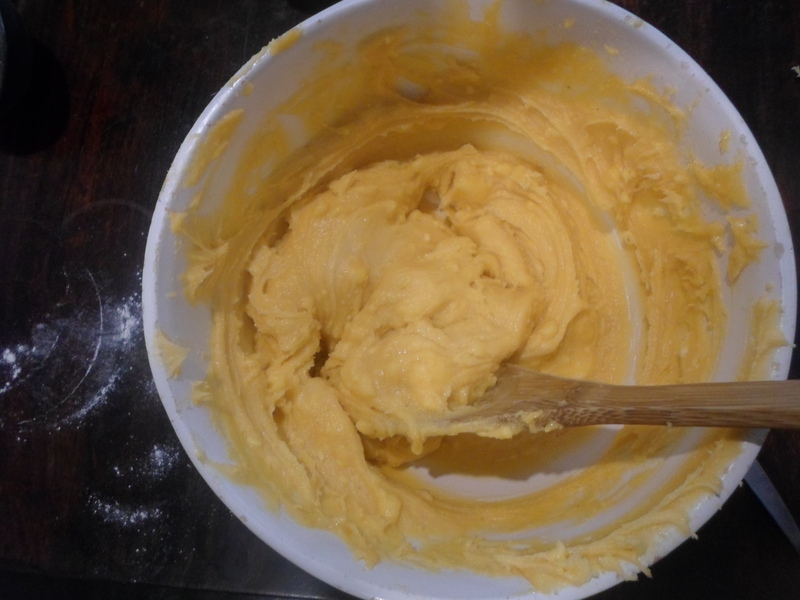 Even though sponge is so light and fluffy when its cooked, the batter is unusually dense and I had a very difficult time incorporating the butter into the sugar and flour with an old-fashioned beater – a task similar to mixing cement with a wooden spoon. I fought back tears and curse words, and gave up at least twice before I was ‘happy’ with the batter. And then I moved on to the meringue with as much positivity as I could muster. 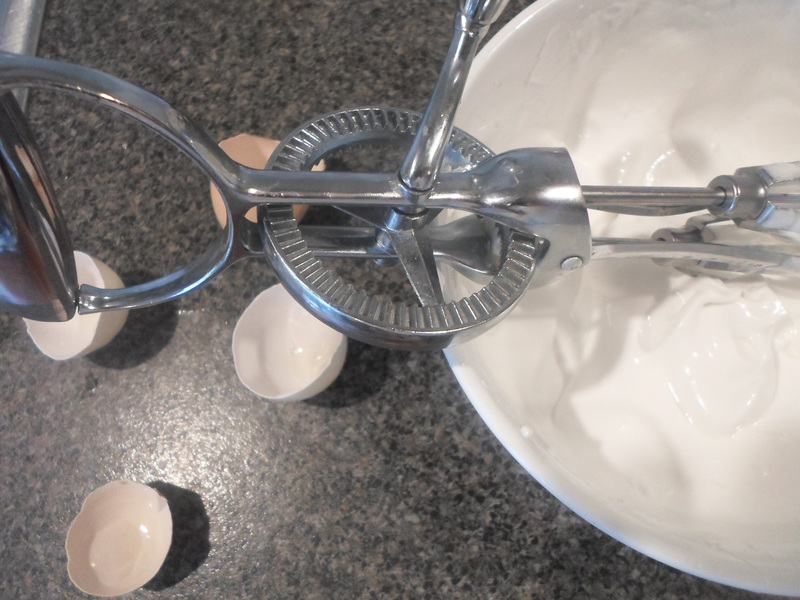 I love making meringue, even when I have to use a hand-held beater; I love watching the egg whites fluff up and adding the sugar teaspoon by teaspoon makes it seem like there isn’t that much sugar going into it. As I added the final dash of sugar and a whisper of vanilla, a new sense of optimism had been whipped into me. That feeling didn’t last long. After smearing the bottom of my cake tin with half of the sponge batter, I topped it with the meringue and dotted it with flecks of blood-red jam. 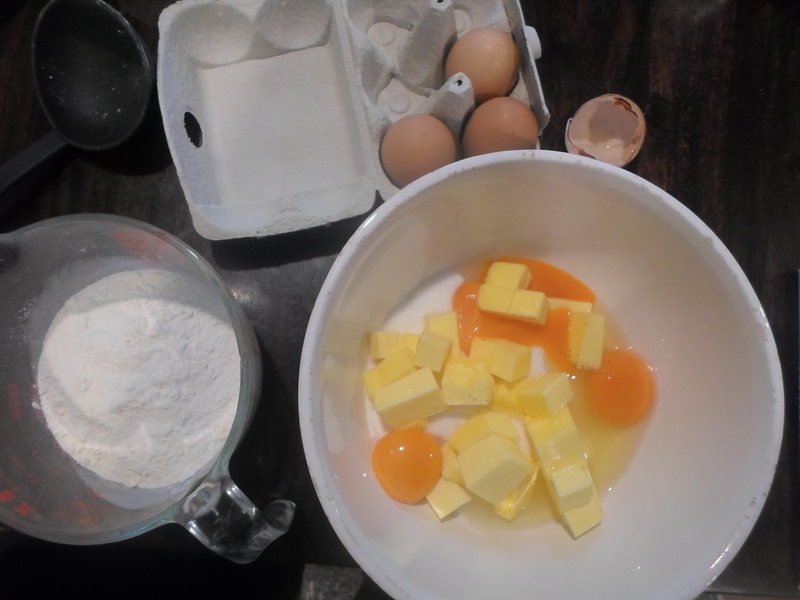 It was at this precise moment, as I stood there admiring the how smooth and plump my meringue layer was, that I put two and two together – I was about to cover my meringue, silky and light, with this thick and heavy cake mix. Gravity is a thing that we have known about for centuries; what goes up must come down and all that jazz. Like a multi-coloured cocktail, a heavier substance will sink to the bottom of a lighter one. I almost lost it as I watched the top layer of cake getting swallowed up into a pure white sea of sugar. I baked it anyway. 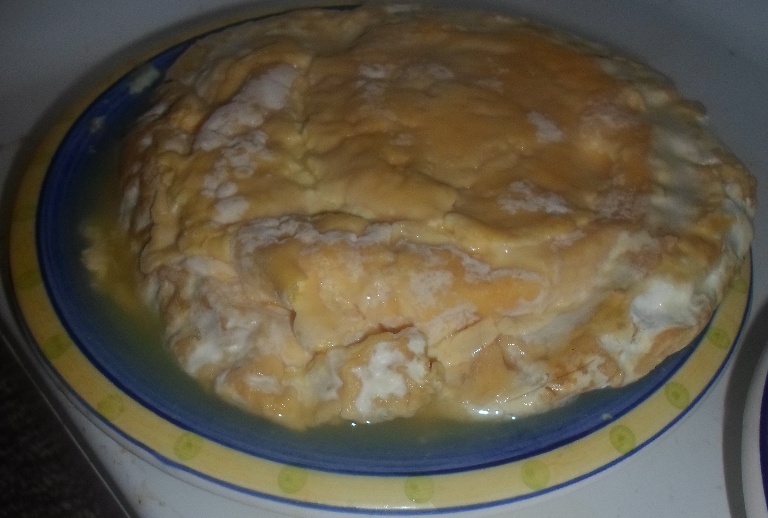 It was edible, it was delicious, it was not at all what I had wanted to create. The base was light and spongey, bright yellow from all of the egg yolks that I had used and the top was sweet and crunchy. 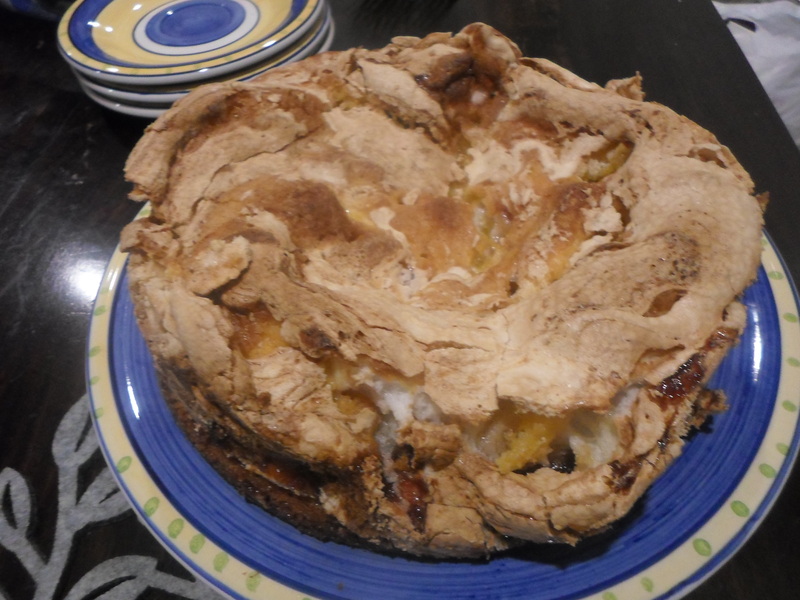 It was kind of like a spongey, jammy version of my meringue cake, funny that! 2 egg whites and 1/2 of a cup of sugar made more than enough meringue. 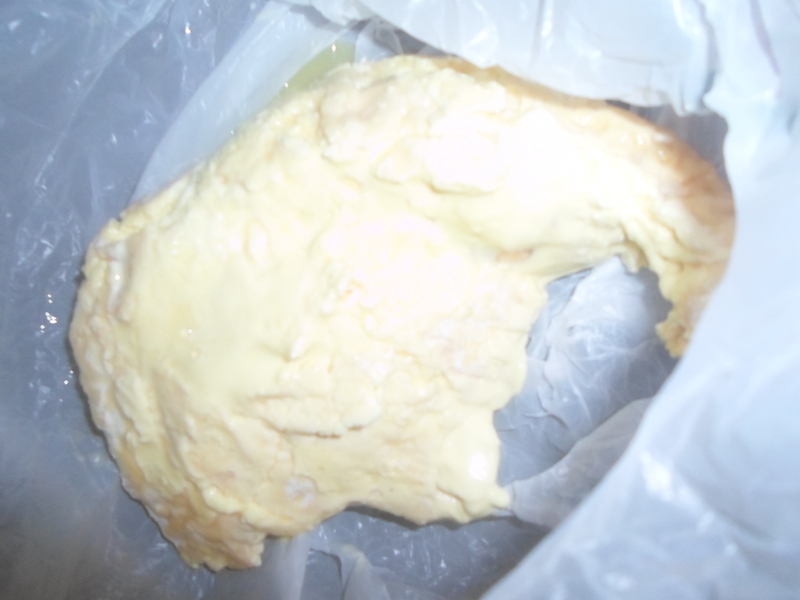 Because of the meringue, the cooking time was longer than a usual sponge – 40 minutes at 170°C as opposed to 20 minutes normally.